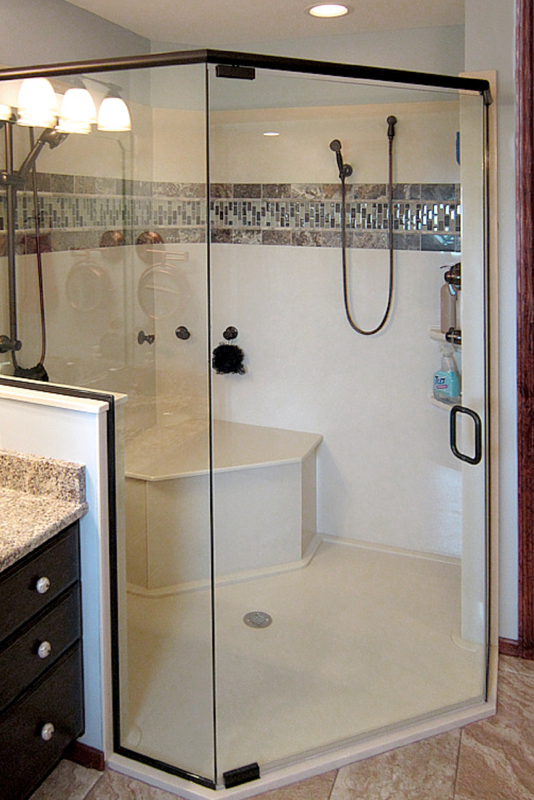 How to design a solid surface shower pan. A shower base is useless if it doesn’t serve the needs of all family members (from grandchildren to grandparents). Towards that end solid surface (or cultured stone) options can include roll in entries for those with mobility challenges, low threshold curbs (1 ½” high) for a sleeker contemporary design, mid-height curbs (which are 2 3/4″ tall) or standard full height curb (4 ½” high) which is a popular option for smaller spaces like corner enclosures. Note – even if you think you may need a roll in shower down the road you may want to use the low-profile curb because you can always add a separate ramp up curb extension down the road. 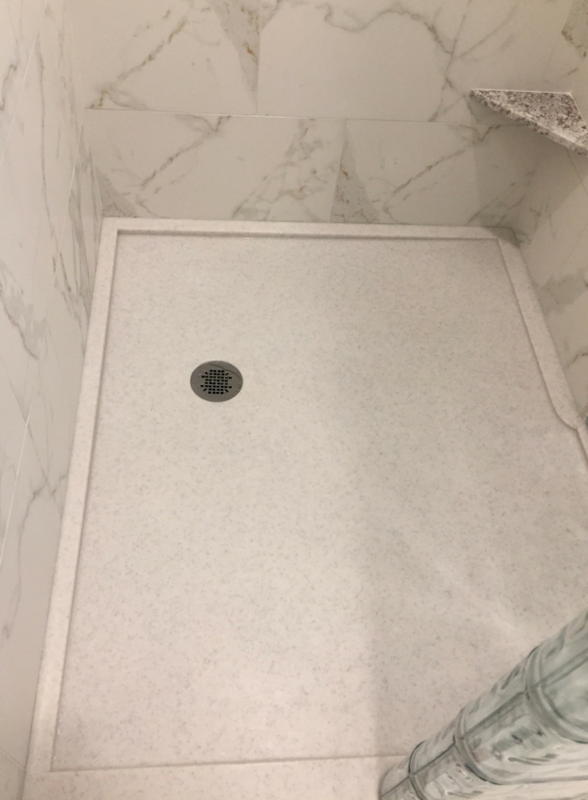 One huge advantage of solid surface over acrylic, fiberglass or tile pans is the ability to create any design while maintaining a low maintenance grout-free surface. These bases are available in standard sizes and shapes (including squares, rectangles, NEO angle shapes) and also custom layouts with offset curbs, designs for curved glass block shower walls, angles of even round shapes. Don’t think just because you have a custom sized shower you have to put up with having your scrub brush be your constant companion with a tile shower! 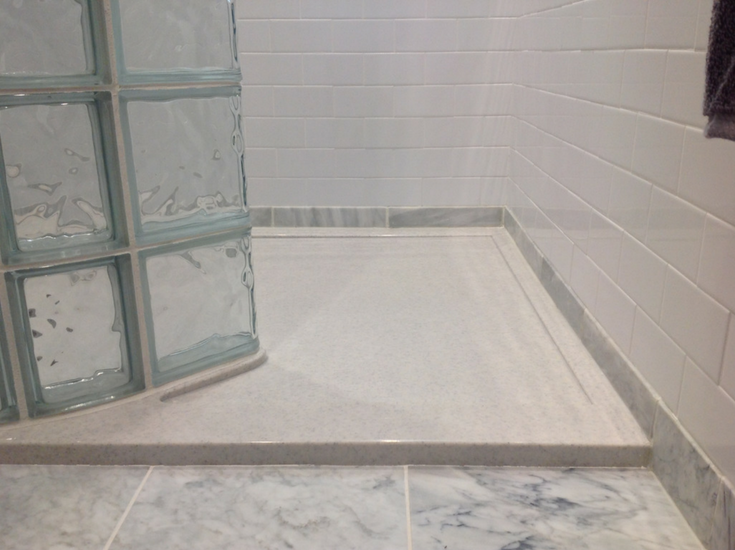 Using a standard sized shower base can be cost effective if there are not major costs associated with moving the pre-chosen drain location of a standard base. If moving your drain will be costly given the structure under the shower pan (moving a drain in a concrete floor can be costly and difficult to do or sometimes the location of existing floor joists can make it tough to use a standard pan) then having a shower pan made which allows you to use your existing drain location can be smart. 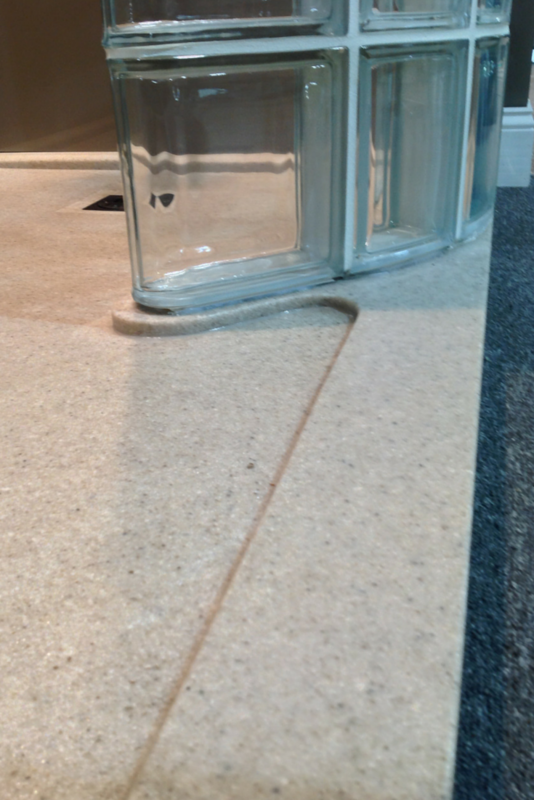 With custom solid surface shower pans any drain locations (or even a cool looking wider linear drain) can be used. Now you can even get a stylish linear drain with a cultured granite or solid surface pan. – In solid surface (or cultured granite) bases you can choose between a high gloss finish (which can really stand out) or opt for the understated look of the matte type finish. Irrespective of what finish you choose all of these bases have a textured bottom surface for safety and traction control, although the safest option is the matte finished base. It’s always nice for interior decorating purposes to have lots of color options. Solid surface pans come in over 50 different colors so there will be a choice for most any décor. It’s also nice to know you can express your individuality and not have to settle for boring white or beige. While the shower pan is the “foundation” of the shower matching the base with grout free and decorative solid surface shower walls and vanity countertops can tie the entire bathroom together and reduce maintenance. For questions or a design consultation on how to select solid surface shower pans, walls or countertops comment or call the numbers below. 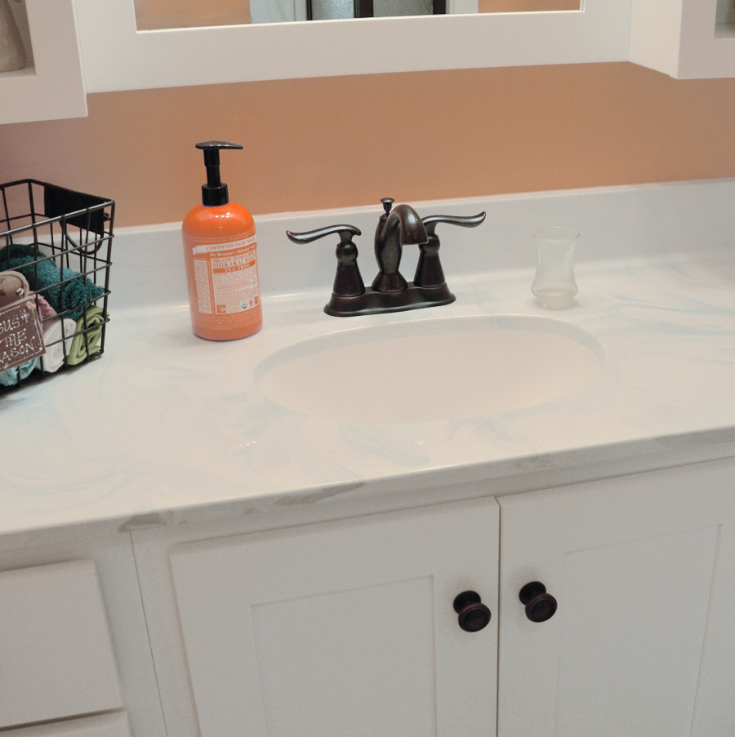 For nationwide solid surface pan, wall and countertop supply call Innovate Building Solutions (877-668-5888). 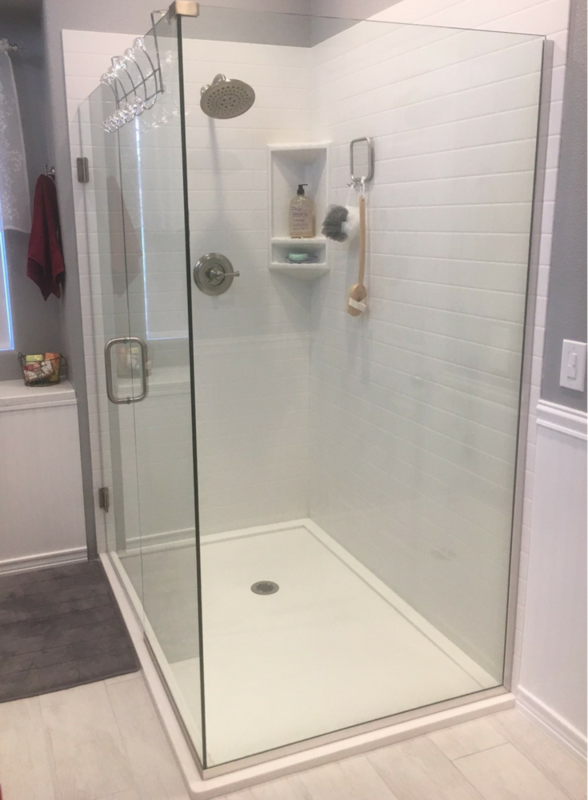 For bathroom remodeling contact The Bath Doctor in Cleveland (216-531-6085), Columbus (614-252-7294) or Cleveland Design and Remodeling (216-658-1270).